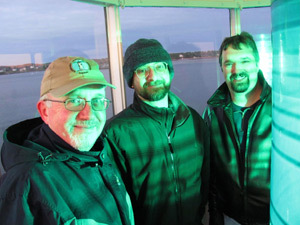 Each night throughout the year, Portsmouth Harbor Lighthouse faithfully guides mariners along the Piscataqua River to ports of call in Portsmouth, New Hampshire and Kittery, Maine, but when the calendar turns to the month of December and temperatures trend downward, the beacon does more than guide seafarers – it warms their holiday spirits too. 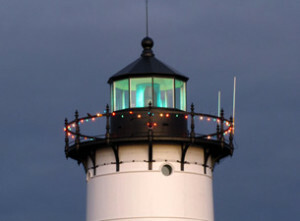 Thanks to its “keepers” – Friends of Portsmouth Harbor Lighthouses, the sentinel is decked out for Christmas each season with festive decorations and strings of colorful lights that adorn the tower’s lantern gallery, windows and entryway. Though other lighthouses around the country are “dressed up” for the holidays too, what makes Portsmouth Harbor Lighthouse so special is that its festive appearance is not only for the admiring public, but also for Coast Guard guardians and those who go down to the sea. 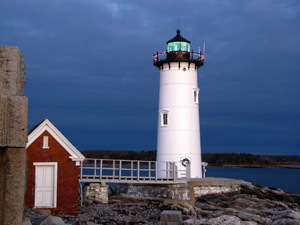 The close proximity of Portsmouth Harbor Lighthouse to the Piscataqua River’s shipping channel and U.S. Coast Guard Station Portsmouth presents a unique opportunity to share a little Christmas spirit with those who ply the nearby waters. From deep-draft tankers and the occasional submarine to lobstermen and various Coast Guard assets, all are treated to the beacon’s merry sight as they pass by. The symbolic greeting has to warm the heart of many a mariner who makes a living on the water, all while coping with December’s bitter winds and icy temperatures, for the sea knows no warmth at this time of year otherwise. 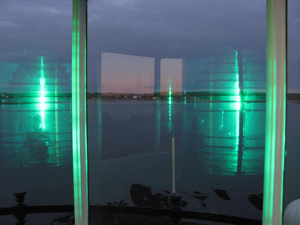 A built-in holiday aspect of Portsmouth Harbor Light’s festive appearance is its gorgeous fourth order Fresnel lens. 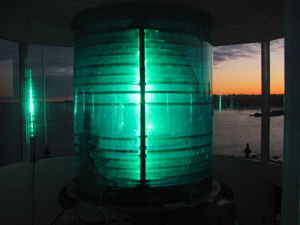 At any other time of the year, the Fresnel lens, which is encircled by a green-colored Lexan panel to give the lighthouse its signature green light characteristic, is simply a different color navigation beacon than the nearby white light of Whaleback Lighthouse. During the month of December, however, the aura of the green light is suddenly transformed into so much more. 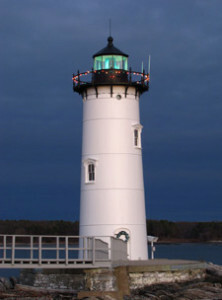 At Christmastime, one glance at Portsmouth Harbor Light’s green beacon aglow can immediately conjure up the notion that the sentinel’s altruistic purpose somehow goes beyond its normal benevolent assistance to the mariner. Though this notion cannot be defined, for those who feel Christmas in their hearts, the feeling nonetheless can be both profound and undeniable. By combining the symbolic power and seasonal effect of the Fresnel lens with an array of holiday decorations and colorful lights, the Friends of Portsmouth Harbor Lighthouses, a chapter of the American Lighthouse Foundation, succeeds each year in achieving the spirit of Christmas. 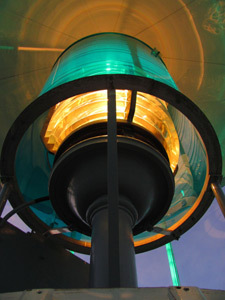 For as each vessel and boat passes by Portsmouth Harbor Lighthouse, the beacon’s merry appearance and silent salutation is transformed into a gift to the seafarer that exceeds materialistic boundaries. The beauty of Christmas is that no matter where we are or where we are going, the joy of the season is best kept in our hearts and shared with others – something that a festively decorated Portsmouth Harbor Lighthouse never fails to give and inspire for those who cast a glance its way during the holiday season. This makes me want to come for a visit! Jon and I have not been back to NH/ME since about 1996. 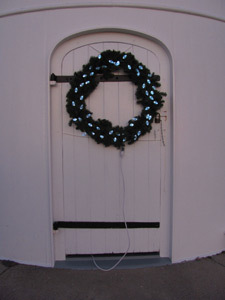 Happy Holidays Portsmouth Light from another light right up the coast! Great photos,jolie! See you this summer(early July) Jeremy…John and I will be driving down to the New England States to see the lights (your lighthouse cousin from Atlantic Canada!). Joyeux Noel from Nova Scotia!